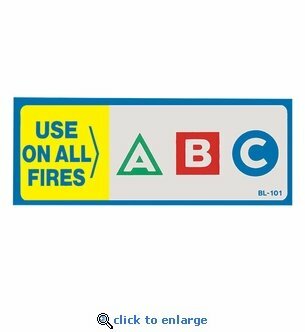 Home > Fire Safety & EMS > Fire Extinguisher Inspection Tags, Labels & Fasteners > USE ON ALL FIRES - ABC Fire Classification Label - 4 1/2" x 1 3/4"
Home > Fire Extinguisher Inspection Tags, Labels & Fasteners > USE ON ALL FIRES - ABC Fire Classification Label - 4 1/2" x 1 3/4"
USE ON ALL FIRES - ABC Fire Classification Label - 4 1/2" x 1 3/4"
This "USE ONLY ON ALL FIRES" fire extinguisher classification label is 4.5" w x 1.75" h and is designed to quickly determine the extinguisher's designated use. The easy to understand text and graphics on this label meet NFPA standards and clearly show that the fire extinguisher can be used for all Class A, B and C fires. Use these labels directly on fire extinguishers or on cabinets. Our self-adhesive vinyl labels are silk screen printed with fade-resistant UV inks then laminated to ensure long life. Classification A: Fires whose fuel is paper, wood, cloth or other ordinary combustibles. Classification label should always face outward. Label all fire extinguishers clearly with the class of fires it can be used.